Boy do I have the most amazing recipe to share with you guys today! My hubby absolutely LOVES the black bean dip that we get at a local restaurant here named Phil Sandovals. This Bean dip turned out to be even BETTER than the one he LOVES at that restaurant. Me and the kiddos COULD NOT STOP EATING IT. I’m so glad I made a double batch! A couple of weeks ago I got invited to make a recipe from A Dish Of Daily Life’s blog because she had to have a really scary surgery with a long recovery time. This will be a way for our group of blogger friends to help drive traffic to her amazing blog, while she recovers. I am ALWAYS excited to make a recipe from Michelle’s blog because it is FULL of the most amazing food and her pictures are DROOL WORTHY!!! Check out the PB & J Bar Cookies with Strawberry Jam I made of hers last year! SOOOO AMAZING! Heat bacon grease in a skillet and sauté the peppers, onions, and carrot until soft. Add the minced garlic and cumin and continue sautéing until fragrant, only about another minute. Add the can of Rotel tomatoes and the 2 cans of black beans to the vegetables. Cook for a few minutes longer on low; remove from heat. Add cilantro and lime juice and puree. Add salt to taste. 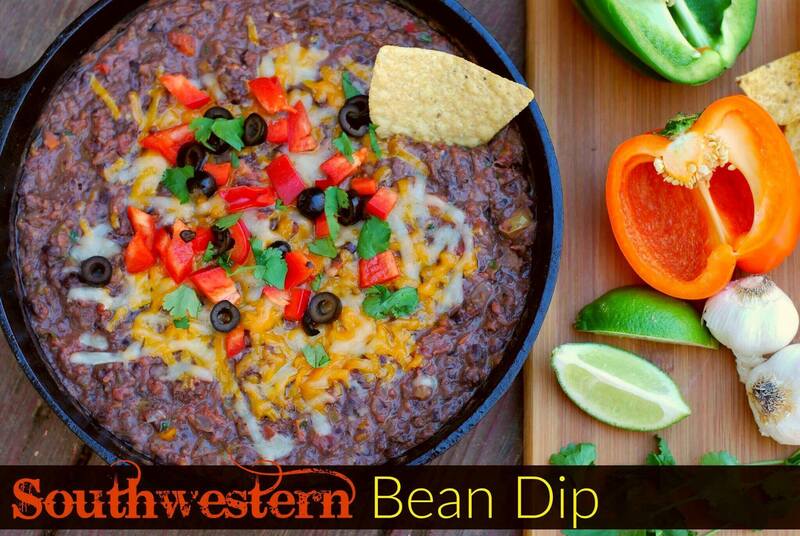 If desired, add bean dip to a cast iron skillet or other oven safe dish. Top with cheese and bake at 350 degrees until cheese is melted. Top with additional toppings: tomatoes, black olives, fresh jalapeno, cilantro, etc.... and serve. Enjoy! Check out more wonderful recipes of A Dish Of Daily Life‘s that are being featured over the next couple of months! Looking for more AMAZING dips? Check out these 20 Dang Delicious Dips from over at An Affair From The Heart! This dip looks and sounds like something I would love! I think everyone of the recipes that have come from Michelle’s blog have been amazing! Mmm. Just in time for game day!! This looks like the perfect comfort food to me. I think I lived in bean dip when I was a teenager.